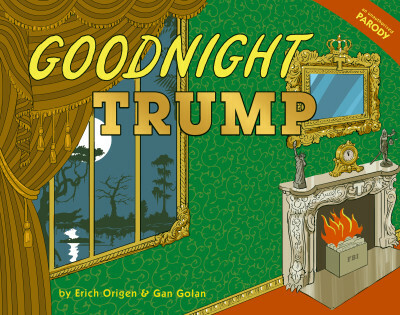 Erich Origen and Gan Golan, creators of Goodnight Trump, on the message behind their new book. Is it too early to say “Goodnight Trump”? As with Goodnight Moon, Goodnight Trump is about the process of saying goodnight, which begins with us truly seeing and naming all the things in this “very classy” room. When we open the book, the man-child, Trump, is clearly ready for us to begin the process of saying goodnight. That process involves certain characters in the room waking up. So the book takes us from the present situation to the moment when we will finally be able to turn out the lights on this whole sad charade. Why is the book funny and sad rather than just funny? 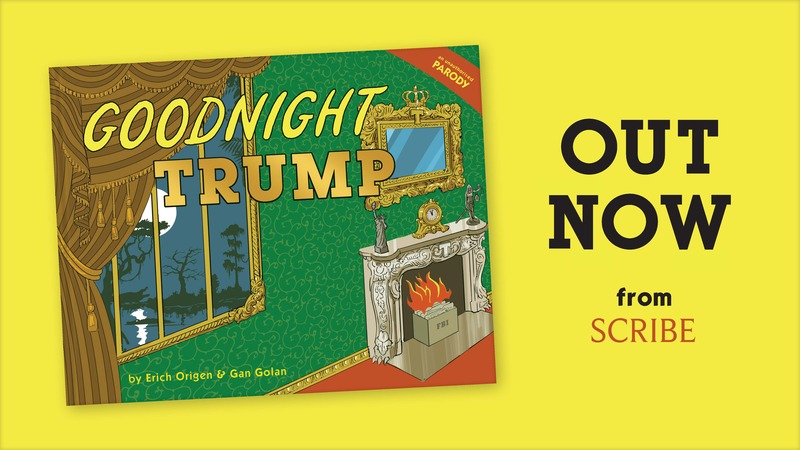 A: The language and art in Goodnight Trump reveals and reflects the damage done by the man-child-in-chief, including traumas inflicted upon children and families. There’s simply no way to represent the nature of those tragic realities without us feeling incredible sadness for the people we know are suffering—not to mention the grief we feel at seeing some of our nation’s most cherished values get flushed down a golden toilet. When we turn out the lights on this administration, the book will start to feel more like a celebratory goodnight and good riddance. But the sadness will still be there—and we should never forget it. Is Goodnight Trump for children? Goodnight Trump is a parody of a children’s book, for adults—but this question should make adults pause and think about the impact this administration has had on children. “Tender age” children have been psychologically tortured, tear-gassed, and killed. Bullies have been celebrated as heroes. White nationalists have been described as “fine people.” Girls, seen as lesser than boys, have been “grabbed,” and worse. In schools and churches, children are gunned down, and we’re told the only answer is more guns. Science is dismissed as meaningless, along with any fact that cannot be monetised. We’ve heard that tweens and teens facing these realities have found solace in Goodnight Trump. We don’t market the book to them; parents can decide whether or not to share the book with their children. And while Goodnight Trump isn’t written for children, it is dedicated to them.